Bomp Records' exquisitely lo-lo-fi Iguana Chronicles proudly soldiers forward with this hour's-plus of rehearsal tapes from the Stooges' glory daze pre- (and possibly even post-) "Raw Power." 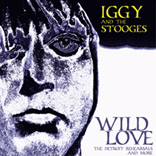 Sure, some of this material consists of little more than jolly hi-jinks and jams, but with a spokesperson the likes of Iggy at the mike, even the ad-libs are never less than stellar --and more often than not on "Wild Love" quite achingly autobiographical as well. As should be expected, the musty basement tapestries of Exile On Main Street waft throughout (especially during the "Hey Baby" / "I Came From Nowhere" sequence), while the eerily prescient, guitar-and-beatbox-accompanied "Ballad Of Hollis Brown" somehow casts Dylan's dustbowl original towards downright motor city madness. In fact, the true stars throughout this collection are surely Iggy and James Williamson's guitar, and the tracks which feature them alone indeed prove the most revelatory, and to these ears by far the most enjoyable. And speaking of James, the "Delta Blues Shuffle" montage captures his six strings effortlessly morphing from Richard(s) on to Page and then well, well beyond, while "Mellow Down Easy" and "I'm A Man" harken all the way back to the Stooges' most blues-wailing roots in their Willie Dixon meets the Yardbirds then straight back home again flow. End it all for now with the legendary "Til The End Of The Night" (undeniable proof that here was a band that expired long before its time) and one can label "Wild Love" as yet another expertly assembled and annotated collection from those ever-trustworthy curators of the flame over at Bomp.